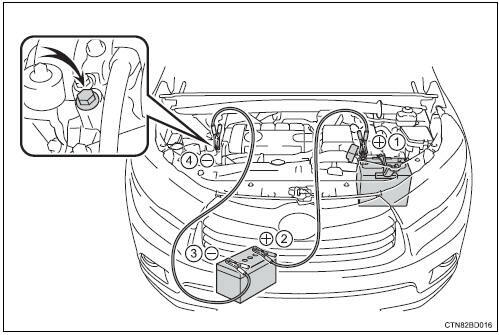 The following procedures may be used to start the engine if the vehicle�s battery is discharged. You can also call your toyota dealer or a qualified repair shop. If you have a set of jumper (or booster) cables and a second vehicle with a 12-volt battery, you can jump start your vehicle by following the steps below. Connect a positive jumper cable clamp to the positive (+) battery terminal on your vehicle. Connect the clamp on the other end of the positive cable to the positive (+) battery terminal on the second vehicle. Connect a negative cable clamp to the negative (-) battery terminal on the second vehicle. Connect the clamp at the other end of the negative cable to a solid, stationary, unpainted metallic point away from the battery and any moving parts, as shown in the illustration. Vehicles with a smart key system: open and close any of the doors of your vehicle with the engine switch off. Vehicles without a smart key system: maintain the engine speed of the second vehicle and turn the engine switch to the �on� position, then start the vehicle's engine. Vehicles with a smart key system: maintain the engine speed of the second vehicle and turn the engine switch to ignition on mode, then start the vehicle's engine. 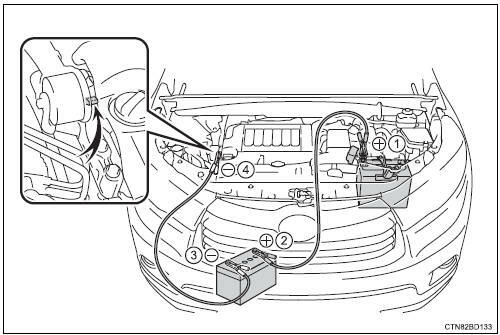 Once the vehicle�s engine has started, remove the jumper cables in the exact reverse order from which they were connected. Once the engine starts, have the vehicle inspected at your toyota dealer as soon as possible. Turn off the headlights and the audio system while the engine is off. Turn off any unnecessary electrical components when the vehicle is running at a low speed for an extended period, such as in heavy traffic. Vehicles with a smart key system: in some cases, it may not be possible to unlock the doors using the smart key system when the battery is discharged. Use the wireless remote control or the mechanical key to lock or unlock the doors. Vehicles with a smart key system: the engine may not start on the first attempt after the battery has recharged but will start normally after the second attempt. This is not a malfunction. Vehicles with a smart key system: the engine switch mode is memorized by the vehicle. When the battery is reconnected, the system will return to the mode it was in before the battery was discharged. Before disconnecting the battery, turn the engine switch off. If you are unsure what mode the engine switch was in before the battery discharged, be especially careful when reconnecting the battery. Vehicle with power back door: the power back door must be initialized. make sure each jumper cable is connected to the correct terminal and that it is not unintentionally in contact with any other than the intended terminal. Do not allow the other end of the jumper cable connected to the ƒg+ƒh terminal to come into contact with any other parts or metal surfaces in the area, such as brackets or unpainted metal. Do not allow the + and - clamps of the jumper cables to come into contact with each other. Do not smoke, use matches, cigarette lighters or allow open flame near the battery. when working with the battery, always wear safety glasses and take care not to allow any battery fluids (acid) to come into contact with skin, clothing or the vehicle body. Do not lean over the battery. In the event that battery fluid comes into contact with the skin or eyes, immediately wash the affected area with water and seek medical attention. Always wash your hands after handling the battery support, terminals, and other battery-related parts. Do not allow children near the battery. When connecting the jumper cables, ensure that they do not become entangled in the cooling fan or engine drive belt.